So, what do you call a bibliophile whose obsession with books borders on the unhealthy? No, it’s not a joke. I’m really wondering. Because that’s what I think I am. 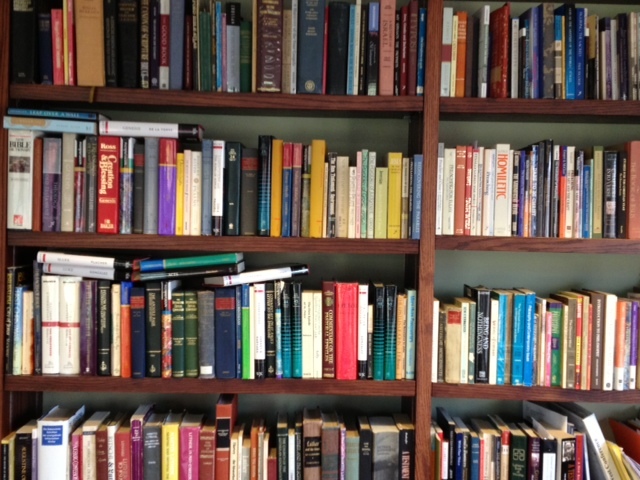 I have an office full of books. I have shelves and shelves of books at home. I have stacks of books that I have bought recently (recently, as in the last 5 years), always, of course, thinking that I would read them, that I was interested in them. It’s true — I do intend to read them; I am interested in them. But I also have a life apart from books, and my proverbial reader’s eyes are consistently bigger than my schedule’s stomach. So, back to the shelves of books in my office. All of them I thought I would use. Some of them I use. And many of them are there taking up space. Maybe they aren’t what I thought they were. Or I have changed and my sensibilities no longer fit the particular slant of the book that is on my shelf. I’m not sure who has betrayed whom, but I have lately realized that there are many books in my office library that I have no good reason for keeping. So, I’ve decided I’m going to purge. I haven’t exactly decided the criteria. No longer reflect my theology? Haven’t taken the book down in 5 years? 10 years? The theology is outdated? The topic is outdated? This entry was posted in Uncategorized on October 9, 2012 by Jim Honig. I gave some to a seminarian … Sold some at a bookstore … I’m filling another box and thinking about the same questions you raise … I’ll be looking forward to your future posts! Thanks, Curt. I have a son who is a seminarian, and he wants the first right of refusal. I haven’t even thought very concretely about what I will do with the rest of them. I’m still trying to muster up the courage (and the time!) to actually do this. I gave away a lot of books this summer – mostly children’s fiction chapter books – to make room for the still growing number of books I have. I actually found the act of giving the books away cleansing – letting go of the list of things I was going to do with the books but hadn’t had time to and wouldn’t have time to do! There is something cleansing about it isn’t there? I haven’t decided what I’m going to do with the books that aren’t making the cut. Some of them are so dated that I wonder if there’s any use for them at all.